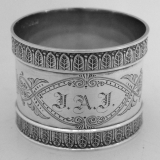 English open work sterling silver napkin ring Sheffield 1914. 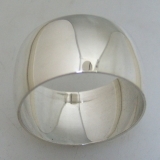 This beautiful napkin ring is 2" - 1 1/2" and weighs 32 grams or 1 ozs troy. The excellent original condition and clear, crisp detail, with no removals, repairs or alterations, make this an especially attractive offering. Monogrammed JGW, the soft, warm, original antique finish is present, with no buffing or machine polishing. 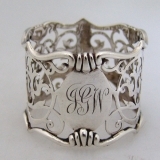 American sterling silver napkin ring by Wood & Hughes 1880. This handsome napkin ring measures 1 7/8" - 1 1/2" and weighs 35 grams or 1.1 ozs troy. The excellent original condition and clear crisp detail with no removals, repairs or alterations, make this an especially attractive offering. Monogrammed JAJ, the soft, warm, original finish is present, with no buffing or machine polishing. American sterling silver napkin ring by Tiffany & Co. 1940-1960. Dimensions: 1 3/4" - 1", and weighs 38 grams or 1.2 ozs Troy. The pristine condition and crisp detail, with no monograms, removals, repairs or alterations, make this an especially attractive offering. The soft, warm, original finish is present, with no buffing or machine polishing. 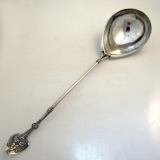 Splendid American coin silver ladle, gracefully adorned with elegant ornamental lillies. 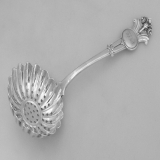 This lovely soup ladle was expertly crafted in the late Civil War Period, c. 1865. The bowl is embellished with delicate brite cut designs, and attached to a superbly designed tripod handle with applied floral motif. It measures 12 1/3" in length and weighs 100 grams or 3.21 troy ounces. The pristine condition and crisp details, with no monograms, removals, repairs or alterations, make this an especially attractive offering. The soft, warm, original finish is present, with no buffing or machine polishing. 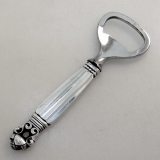 Danish sterling silver bottle opener in the Acorn pattern by Georg Jensen c.1950. This useful and artistically designed piece measures 5 1/2" long. The working end is Georg Jensen stainless steel. The exceptional original condition and crisp detail, with no monograms, removals, repairs or alterations, make this an especially attractive offering. The soft, warm, original finish is present, with no buffing or machine polishing. 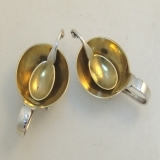 Danish sterling silver salt cellars with spoons by Georg Jensen, c.1925. Graceful lines and elegant details combine to enhance this unique pair. They each measure 1 3/8" in diameter and 2" in length. They weigh a combined 33 grams or 1.06 Troy ounces. The immaculate condition and crisp detail, with no monograms, removals, repairs or alterations, make this an especially attractive offering. The soft, warm, original finish is present, with no buffing or machine polishing We have two pair of these for sale. The price is for one pair. 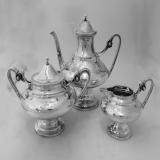 Stunning American sterling silver tea set, made by Gorham for Tiffany & Co, of New York City, c.1868. A superb example of Aesthetic style, featuring figural pine cone finials on graceful handles and spout, classical beaded borders and elegant acid etched designs throughout. This magnificent set weighs a substantial 1784 grams or 57.57 Troy ounces. The tea pot is 8 1/2" high with a 6 1/2" diameter. The sugar bowl is 6" with a 5 1/2" diameter. The creamer is 3 1/2" high with a 4 1/2" diameter. The impeccable condition and clear, pristine detail, with no monograms, removals, repairs or alterations, make this an especially attractive offering. The soft, warm, original finish is present, with no buffing or machine polishing. 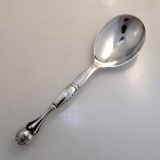 Danish sterling silver serving spoon in the 38 pattern by Georg Jensen, c.1950. The serving spoon measures 9 3/4" long, and weighs 130 grams or 4.18 Troy ounces. The excellent condition and clear, crisp detail, with no monograms, removals, repairs or alterations, make this an especially attractive offering. The soft, warm, original finish is present, with no buffing or machine polishing. 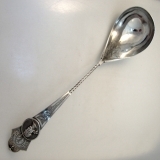 A splendid American silver soup ladle masterfully crafted by Gorham Silversmiths c.1860 in the rare Medallion pattern. 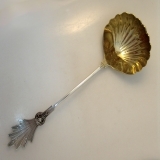 This exquisite ladle features a delicately fluted bowl done in gold vermeil. It measures a stunning 13 3/4" long. It weighs 196 grams or 6.3 Troy ounces. The pristine condition and clear, crisp detail, with no monograms, removals, repairs or alterations, make this an especially attractive offering. The soft, warm, original finish is present, with no buffing or machine polishing. Danish sterling silver grape shears in the Acorn pattern by Georg Jensen c.1945. These rare grape shears measure 5 1/2" long. The exceptional original condition and clear, crisp detail, with no monograms, removals, repairs or alterations, make this an especially attractive offering. The soft, warm, original finish is present, with no buffing or machine polishing. Danish sterling silver small open salt dish by Georg Jensen c.1930. This darling salt dish measures 2 1/8" across the handle and weighs 13 grams or 0.4 ozs Troy. The excellent original condition and clear, crisp detail, with no monograms, removals, repairs or alterations, make this an especially attractive offering. The soft, warm, original finish is present, with no buffing or machine polishing. 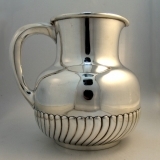 American sterling silver water pitcher made by Bigelow, Kennard & Co with swirling fluted bottom matching Gorham Colonial pattern 1885. This handsome water pitcher measures 7 7/8" tall, 7 1/8" across the handle and weighs 817 grams or 26.2 ozs Troy. The excellent original condition and clear detail, with no removals, repairs or alterations, make this an especially attractive offering. Monogrammed T, the soft, warm, original finish is present, with no buffing or machine polishing. 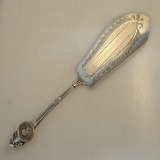 American sterling silver fish server in the Medallion pattern by Gorham Silversmiths 1865. This handsome server measures 12 1/8" long and weighs 120 grams or 3.9 ozs Troy. The excellent original condition and clear detail, with no removals, repairs or alterations, make this an especially attractive offering. Monogrammed LAK to ST, the soft, warm, original finish is present, with no buffing or machine polishing. 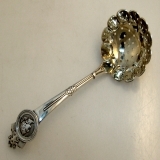 American coin silver sugar sifter ladle in the Medallion pattern by Wood & Hughes, 1865. This handsome ladle measures 7 7/8" long and weighs 65 grams or 2.1 ozs Troy. The excellent original condition and clear, crisp detail, with no monograms, removals, repairs or alterations, make this an especially attractive offering. The soft, warm, original finish is present, with no buffing or machine polishing. 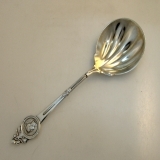 American sterling silver serving spoon in the Medallion pattern by Gorham Silversmiths 1865. This handsome spoon measures 9" long and weighs 93 grams or 3 ozs Troy. The excellent original condition and clear detail, with no removals, repairs or alterations, make this an especially attractive offering. Monogrammed B, the soft, warm, original finish is present, with no buffing or machine polishing. 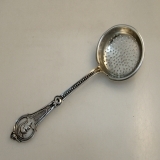 American sterling silver small sugar sifter in the Medallion pattern by Gorham Silversmiths 1864. This Handsome ladle is 6 1/4" long and weighs 45 grams or 1.4 ozs Troy. The excellent original condition and clear detail, with no removals, repairs or alterations, make this an especially attractive offering. Monogrammed A in an ornate period script, the soft, warm, original finish is present, with no buffing or machine polishing. American coin silver child′s cup, with applied Medallions and floral engravings, made by Albert Coles c.1865. This handsome cup measures 3 1/4" tall, 4 1/8" across the handle, 3" in diameter and weighs 113 grams or 3.6 ozs Troy. The excellent original condition and clear detail, with no removals, repairs or alterations, make this an especially attractive offering. Monogrammed Fredk G Cole, Dec 1st 1865, the soft, warm, original finish is present, with no buffing or machine polishing. American coin silver Medallion baby cup c.1865. This handsome cup measures 2 5/8" tall, 3 5/8" across the handle, 2 5/8" in diameter and weighs 95 grams or 3 ozs Troy. The excellent original condition safe for a few minor dents on the handle and the body, no removals, repairs or alterations; make this an especially attractive offering. Monogrammed Grandfather Smith to Robbie Nov 29 1867, the soft, warm, original finish is present, with no buffing or machine polishing. German 800 Standard silver gilt floral repousse napkin rings (pair)in an original fitted box from Paris c.1890. These beautiful napkin rings mesure 2" - 1 1/2" and weigh 44 grams or 1.4 ozs Troy (each). The excellent original condition and clear, crisp detail, with no monograms, removals, repairs or alterations, make this an especially attractive offering. The soft, warm, original finish is present, with no buffing or machine polishing. 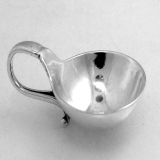 American sterling silver barrel shaped childâ€™s cup made by Tiffany & Co. c.1860. This beautiful cup measures 6 1/4" tall, 3 7/8" across the handle and weighs 181 grams or 5.8 ozs Troy. The excellent original condition and clear detail, with no removals, repairs or alterations, make this an especially attractive offering. Inscribed Annie, the soft, warm, original finish is present, with no buffing or machine polishing. English sterling silver Rococo style sugar shaker with floral finial London 1892. This handsome shaker measures 7 1/4" tall, approx. 3 1/4" wide and weighs 301 grams or 9.7 ozs Troy. The excellent original condition and clear detail, with no removals, repairs or alterations, make this an especially attractive offering. The shaker bares a dear crest; the soft, warm, original finish is present, with no buffing or machine polishing. Indian colonial sterling silver large beaker made by Hamilton & Co. c.1850. This handsome beaker measures 4 1/8" tall, 3 5/8" in diameter and weighs 261 grams or 8.4 ozs Troy. The interior has a gold wash. Normal use marks and light wear consistent with age. The beaker bears a period crest of a wolf, the soft, warm, original finish is present, with no buffing or machine polishing. 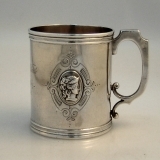 Chinese export silver tankard with glass bottom made by Lee Ching 1846-1880. This handsome tankard measures 4 3/4" tall, 5" across the handle, 4" diameter of the bottom and weighs 489 grams or 15.7 ozs Troy. The excellent original condition and clear detail, with no removals, repairs or alterations, make this an especially attractive offering. The tankard bears a lionâ€™s paw with a cross crest, the soft, warm, original finish is present, with no buffing or machine polishing. English sterling silver 4 open salts with original cobalt glass liners, made by Crispin Fuller London 1802. 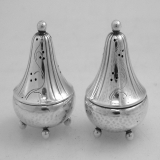 These elegant boat shaped open salts with bracket feet and engraved decorations measure 3 1/4" long, 2 1/2" tall, 2 1/8" wide. Four period master salt spoons with engraved decorations are included, date mark between 1783-1787. Spoons bear a crest of a rampent lion with the initials FM. The excellent original condition make this an especially attractive offering. The soft, warm, original finish is present, with no buffing or machine polishing. 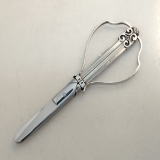 American sterling silver letter opener retailed by Green Leaf & Crosby, made probably by Gorham Silversmiths c.1890. This very unusual letter opener measures 6 5/8" long and weighs 33 grams or 1 ozs Troy. The excellent original condition and clear, crisp detail, with no monograms, removals, repairs or alterations, make this an especially attractive offering. The soft, warm, original finish is present, with no buffing or machine polishing. American sterling silver round tray in the Repousse pattern by Kirk & Son. c.1940. This beautiful and handy tray measures 12 1/4" in diameter and weighs 710 grams or 22.8 ozs Troy. The excellent original condition and clear detail, with no removals, repairs or alterations, make this an especially attractive offering. Monogrammed VNWRO, the soft, warm, original finish is present, with no buffing or machine polishing. Danish sterling silver letter opener in the Blossom pattern by Georg Jensen of Copenhagen, 1933- 1944. Georg Jensen Copenhagen Denmark 1933 - 1945 Sterling Denmark 925, GJ in rectangle;117 Dimensions: 6 3/4" long and weighs 54 grams or 1.7 ozs Troy. The excellent original condition and clear, crisp detail, with no monograms, make this an especially attractive offering. The soft, warm, original finish is present, with no buffing or machine polishing. American sterling silver (from coin silver period) sugar sifter in the Ram′s Head pattern by John R. Wendt for Ball Black & Co, both od New York City, patent 1865. This elegant sifter has s deeply fluted, pierced bowl and a Ram′s Head on the top front of the handle, with a fancy, period monogram, WLMB on the Medallion below thw Ram′s Head. This specail sugar sifter is 7 3/4" long and weighs 64 grams or 2+ ozs. Troy. Monogrammed as described above, the soft, warm, original antique finish is present, with no buffing or machine polishing. The excellent original condition and clear, crisp detail, with no removals, repairs or alterations, make this an especially attractive offering.